Today I dedicate this space to a beautiful mermaid camouflaged as a woman that one day spoke to me from the heart and now explores the planet wearing my clothing line. She is one of those people I didn't need to meet before falling in love because I loved her already. Like an intergalactic sister that I share so many dreams with, someone that I can find myself with when I get lost. Her beauty lies in her nature and authenticity. From el Salvador on her way to Mexico, María Andrés. 5th in the PWA (windsurfing) ranking of waves , the editor of SUP magazine, proves yet again that if you put your mind to it, you can make your dreams come true. You can live your life how you chose to as long as you believe it. AS A PROFESSIONAL ATHLETE, DO YOU THINK THE QUALITY OF YOUR SPORTSWEAR CAN INFLUENCE YOUR PERFORMANCE? WHAT ROLE DOES FASHION PLAY WITHIN YOUR SPORT? Yes it is true that I prefer a bathing suit that fits me well and gives me support, so I don’t go loosing it when I wipe out in a wave. The other thing is I don’t want to have to constantly adjust my swimwear, so I can remain focused on what I am doing and therefore do it better. So although I don't feel that my performance is directly correlated to my swimwear, I do believe that indirectly the right attire helps me stay focused and become better. I believe that finally sports attire is becoming more fashionable. Not only does it have to be sturdy and support it is nice when the clothing is flattering as well. Practical does not have to be synonymous to ugly. WHAT MOTIVATED YOU TO BECOME AN AMBASSADOR OF OUR BRAND; MARIA MALO? I discovered Maria Malo through a video that she had shot with Fanny Bauman, the Swedish windsurfer, she was jamming on her guitar. I thought it was awesome. The images, the music, the atmosphere and the outfits. So firstly I liked her designs and then I found out that not only were they nice designs but they were soft to the touch and eco friendly. I like Maria Malo’s style and the message she emits. Which made me feel like I could totally relate. OUR COMPANY IS MORE THAN A FASHION BRAND, IT’S A LIFESTYLE, A CERTAIN ATTITUDE TOWARDS LIFE. WHICH OF OUR VALUES DO YOU RELATE WITH? All of them. Starting with her slogan #walkthisearthwithoutatrace, the fact Maria Malo’s line is as well as fashionable, made ethically with recycled and sustainable materials makes you feel good about wearing it and supporting her cause. Yes, thank goodness, fortunately more companies are adapting to better their products by making them more environmentally friendly. Even surf, SUP, and windsurf brands are starting to offer alternatives in the way of ECO friendly lines. I hope this will be the only way. These initiatives together with the more conscious consumer is leading the way and forcing traditional companies to adapt and offer a new option for a more eco friendly product, no matter what sector of the industry. Doing things with more respect. IN YOUR WORLD AND ACCORDING TO YOUR FUTURE PLANS….DO YOU SEE A PROBLEM WITH WASTE? ARE YOU CONFRONTED WITH THIS PROBLEM IN THE WATER? Throughout my travels all over the world, on the beaches and in the water where I surf or windsurf I see the very pertinent problem of waste and plastic. Its pretty concerning to be honest. The water is full of floating pieces of plastic, of all shapes and sizes you could possibly imagine. Some windsurfing competitions have to be cancelled due of the amount of garbage floating in the water. So much so that boards can’t glide properly on the water without risk of collision. The things you find on the shores of beaches worldwide is surreal and overwhelming. In some places so much garbage comes floating onto the beach shores, invading the lives of the locals, affecting their daily routines with the waste problem leaving them not knowing how to efficiently solve the issue. In other places, you can tell that the ocean and beach waste comes from the locals themselves. Often due to an educational issue and other times because there is no waste management plan at all. As of a few months ago I am particularly sensitive to this issue, and I keep racking my brain as to what to do on my trips to somehow contribute, and be a part of the grain of salt that moves towards promoting this change. As a traveler and an athlete I'm tired of witnessing the hypocrisy of some of these organizations / events / brands that take advantage of the slogan “clean the beach”. That will just last long enough to take a couple of snap shots and of course the “selfie”. I have hope with the upcoming laws that forbid single use plastic production, as well as seeing old plastics recycled. Giving them s a second life as opposed to laying on beaches perpetually, floating in the oceans or ending up in a turtles stomach. I am also very pleased about the production of long and short term biodegradable products that are coming in to the market. SUSTAINABLE FASHION IS NOT ONLY ABOUT WHAT FABRIC THE CLOTHES ARE MADE FROM BUT ALSO UNDER WHAT CONDITIONS THEY ARE MADE. I LIKE TO EMPHASIZE ON THIS POINT. IS IT IMPORTANT FOR YOU TO KNOW WHERE YOUR CLOTHES WERE MADE AND BY WHOM? ANDIF THEY ARE MADE ENVIRONMENTALLY CONSCIOUS AND RESPECTING THE PEOPLE INVOLVED IN THE PROCESS? Of course it is important! It makes me feel good knowing my clothes are made of bamboo or recycled materials. But also what would it matter if we had such respect for our environment if we weren't treating each other kindly? I believe it to be just as important to respect our environment as to respect the people involved along the process of making any product. I love knowing that the clothes I wear are forming a part of a more ethical and respectful world. These clothes prove that you can have style, and have things made in an ethical way. I hope to feel this way about anything I purchase. That when I go food shopping I don't have everything wrapped in plastic and trays that after a single use fill my trash can as soon as I get home. DO YOU FEEL THAT FASHION CAN BE EMPOWERING? DO YOU FEEL MORE CONFIDENT WHEN WEARING CERTAIN CLOTHES? Yes, I feel more confident if I am comfortable in my body. Dressing in a way that makes me feel good. Feeling good and comfortable gives you confidence which allows you to be happier, have better relationships ….and being happy attracts more of that..no? Ha Ha. DURING TRAINING HOURS AND COMPETITIONS; YOUR NEOPRENE IS LIKE YOUR SECOND SKIN; ESPECIALLY IN COL WATERS. WHAT TYPE OF CLOTHES ARE YOU MOST COMFORTABLE IN OUTSIDE OF THE WATER? Yes…I am in the water a lot…In the past two months I have averaged about 4 hours a day. I sometimes feel like I am going to grow fish scales! Your skin definitely gets more sensitive after spending hours in the water or in the scorching sun in warmer waters. I have become very particular about what I wear when I am on dry land above all I need to be comfortable. Enjoying soft textures that transpire and have certain elasticity. IF YOU HAD TO DESCRIBE YOUR STYLE IN ONE SENTENCE, HOW WOULD YOU DO THAT? Free. I don’t like following rules and regulations, I like to mix and match as I choose, most importantly being comfortable. I like light clothing, that doesn’t constrict me and allows me to move freely. That I don’t really feel it but it hangs just right ha ha I don’t know if I am explaining myself…. I like being original, that is beautiful! SPEAKING OF BEAUTY CAN START A FEW DEBATES. BEING AN ATHLETE OF YOUR CALIBER …. WHAT DOES BEAUTY SIGNIFY TO YOU IN YOUR PROFESSION? I guess beauty to me is directly linked to harmony and happiness. In everything. When the sun reflects on each of the oceans walls while you surf those perfect lines that have been traveling afar and when they finally break so beautifully. Beauty is to be one with that mass of water that envelops the earth, to feel big and small at the same time, to smile within and on the outside, also at the same time. BEING ONE WITH NATURE, IS BEAUTY TO ME. TO HAVE A HEALTHY LIFE, TO BE ACTIVE AND DEDICATED TOWARDS THINGS YOU TRULY LOVE MAKES YOU FEEL GOOD ON THE INSIDE, AND OF COURSE THAT REFLECTS ON THE OUTSIDE. THE OCEAN IS OUR LIFE FORCE…. WHAT MESSAGE WOULD YOU SEND TO THE WORLD FROM THE WATER? Looking at the world from the water has a lot of power to it and I believe lessons too, everyone should experience it at some point inter lives. Whenever I am floating, no matter what part of the world, I try and take a moment to realize where I am and it fills me with joy. I feel so lucky to b able to look at life from this very special angle. And whenever I find myself in these spots I wonder whether I could bottle this sensation and make little pills of it so I could share them with the ones I love. It is that strong of a feeling. My message is get on a board, be it a surf board, a stand up paddle, a boat or a kayak, and just go a little off the shores. Feel where you are and connect to what surrounds you, balance yourself, float, absorb the colors…. feel special because you are starting to look at the world from another perspective. WHEN YOU TRAVEL AS MUCH AS YOU DO, ONE BECOMES VERY PRACTICAL WHEN MAKING YOUR SUITCASE, WHAT CAN'T YOU GO WITHOUT? Ha ha ha …totally…. well, in my two (huge suitcases 240 cm long) I have my boards and my sails, my stand up paddle and loads of cute bikinis …. yes loads!!! Ha ha …and litres of sun cream although I have to say I haven’t found one that I feel 100% about. A few mini skirts and a couple of t-shirts and some boots and I have my uniform covered. I don’t take flip-flops because I would loose them anyway and they are made of plastic lol. Where it is warm, there is sun, palm trees on the shore and a few friends in the water! Ha ha….I prefer 3 metre waves and medium wind…no matter which side. To find myself…. a sunset, floating on my board. I don’t care where, just as long as there are a lot of clouds and reflections. To loose myself…. I would loose myself for a few years on a sail boat, surfing and exploring the islands of the south Pacific. My favorite is the cross back Lia top for sure! I use it for everything Working out on land, surfing…. I even wear it out with a skirt! It is comfortable, cute and it supports. It has everything! IF YOU COULD MAKE ONE WISH, JUST ONE THAT WOULD COME True…. WHAT WOULD IT BE? That we could transmit emotions. To be able to live experiences through others would be amazing. One wish….. The ability to learn faster…. so much would be possible from there…. IN VALDELAGRANA, A DREAM CAME TO FRUITION, YOU DEDICATED YOURSELF TO WINDSURF AND BECAME A PROFESSIONAL, NOW THAT YOU HAVE REACHED THAT GOAL…..WHAT WOULD YOU TELL THAT YOUNG GIRL THAT WOULD ENJOY THE BAY OF CADIZ HANGING ON HER BROTHERS BOARDS? 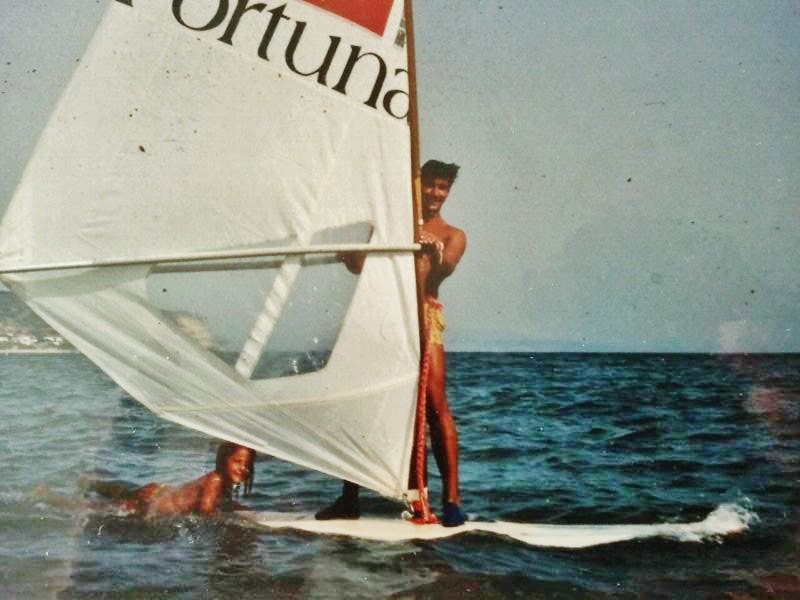 Ha ha ha, what a nice question….I used to dream about traveling and windsurfing, and yes, that is what I do now, and every day I am grateful for it. I am so happy I followed my dreams and didn’t cave in to my insecurities and fears, or more so those of my family and friends. My family has been great in letting me live my life without trying to micro manage it, and that is a blessing. They have let me be free and grow at my own rate, that to me is true love. Today I would tell that young girl that her dream is different, but possible, and just as valid as any other. I would tell her not to fear having different dreams to others. That there is nothing wrong with that. That with dedication and imagination, anything is possible if you truly put your mind to it. That the spectrum of colors that we see is not the entire spectrum, and we can draw paintings that some may not see until the artwork is before their eyes. I would say stay strong and never stop listening to your heart.